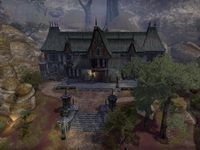 This fortified manor between Arenthia and Skingrad at the headwaters of the Strid River should satisfy all those who aspire to the life of the landed gentry. Inside the gatehouse you'll find gardens, a waterfall, and a mansion in Second Empire style. Strident Springs Demesne is a large player house in northern Reaper's March. The ground floor of the house features an atrium and a side room. The second floor features four small rooms and a gallery around the atrium. The grounds of the house feature a waterfall and pond as well as an accessible tower. To purchase this house you need to have the Imperial Edition of ESO. To purchase it with gold, you must also complete A Friend In Need.